Jacksonville, FL – Over the Veterans Day weekend, Rev. Fr. Tateos Abdalian, the Diocese’s director of Mission Parishes, visited the mission parish of Jacksonville, Florida, where parishioners are continuing the work of renovating a new property that the parish purchased in the summer of 2011. The two-story, 3,600-square-foot building, located on two acres of land, will serve as a community center where local Armenians can gather for worship and for cultural and social programs. Sooren Vardanian and members of the Parish Council are overseeing the team of volunteers who are dedicating their time to the project. Fr. Abdalian met with Mr. Vardanian to discuss the project’s progress. On Saturday evening, Fr. Abdalian led a Bible study session focusing on Sunday’s Gospel reading. During services the next day, the reading was given in Armenian, English, and Russian. 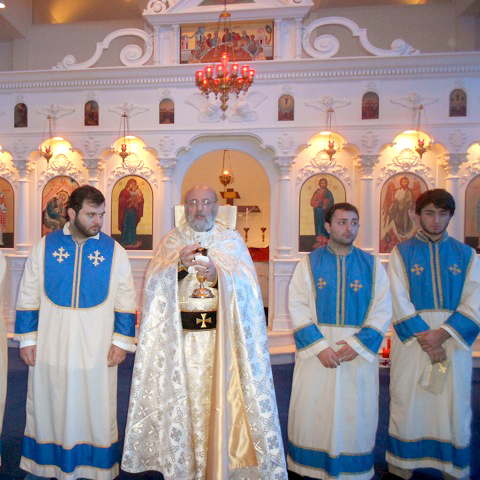 Following the Divine Liturgy on Sunday, the community enjoyed a Thanksgiving celebration, and honored its veterans as well as members who are celebrating birthdays and anniversaries this month. Florida Armenians (FLArmenians) is pleased to announce the launch of our new mobile app for free. Now you can read the latest news and check for upcoming events straight from your mobile device. To download the FLArmenians Mobile App, visit this website from your iPhone, Android or Tablet device and click on the image above.